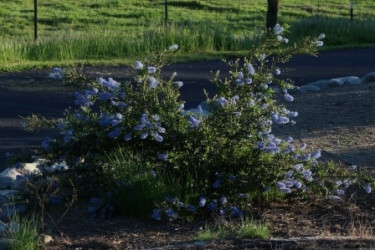 Low growing, spreading mountain lilac. Flowers appear early in spring. Drought tolerant but will tolerate some garden irrigation. 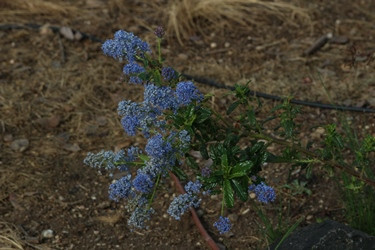 Hybrid of Ceanothus papillosus var. 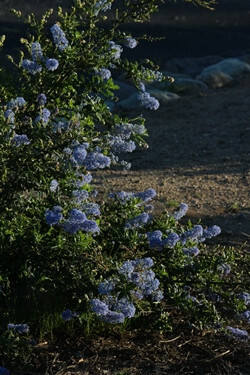 roweanus and Ceanothus thyrsilforius var. griseus. Especially nice in a rock garden or to bring color and texture to mid-sized elevation within a native garden. Can be trimmed to encourage spreading and limit height. Avoid excessive summer irrigation after established.